And so it begins: New York Fashion Week has overtaken our Instagram feeds and this weekend, the fash pack made sure that we got a glimpse of some of the biggest names in the industry and their latest Spring/Summer '19 collections. Strong contenders over the weekend include Ralph Lauren (who held a beautiful show to celebrate his 50th anniversary), Meghan Markle-approved designers Brandon Maxwell and Jason Wu, Ulla Johnson and regionally-renowned brand, Noon by Noor. 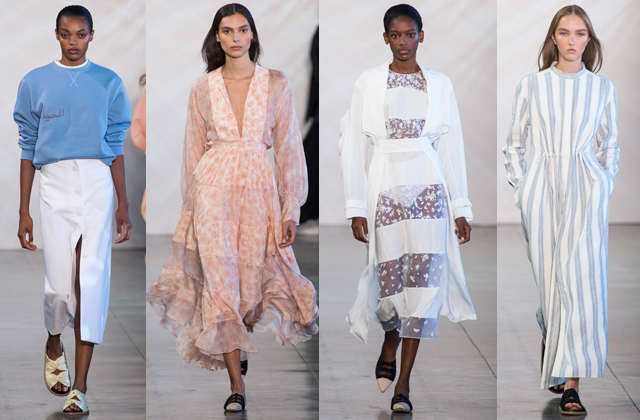 What you need to know: Noon by Noor delivered a soft but strong Spring/Summer '19 collection during New York Fashion Week. The resort-ready separates came complete in a dusty colour palette (think neutrals, sandy pinks and blue haze), as well as rich fabrics that featured striped weaves, mini pleats and fringing. Middle Eastern moment: Hailing from Bahrain, the brains behind the label, Noor Rashid Al Khalifa and Haya Mohamed Al Khalifa, made sure they injected their Middle Eastern background into the collection and offered separates with Arabic writing (top left image), as well as in the silhouettes, as they were influenced by the traditional Middle Eastern costume. What you need to know: Ulla Johnson's bohemian and ethereal creativity was evident on the pieces from the designer's latest Spring/Summer '19 collection. 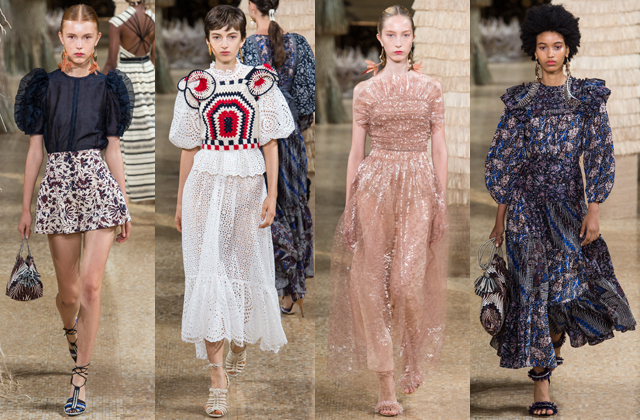 Very feminine forms including billowing sleeves and knee-length dresses were imbued with intricate embroidery, botanical prints and lace for a collection of everyday-ready pieces that were far from basic. Did you know: The collection referenced several cultural ethnicities with threadwork made in India and Maasai beaded aprons. Also, in an aim to be more sustainable, the brand made its quilted pieces by incorporating fabric scraps from previous collections. What you need to know: The Meghan Markle-approved designer delivered a candy-coloured collection on a pink-carpeted runway, and the pieces ranged from everyday necessities like trousers and tailored jackers to red carpet-ready with breathtaking gowns. With a diverse lineup of famous faces fronting the collection, the pieces came in muted jewel tones and lightweight silhouettes. In case you missed it: For the designer's F/W'18 campaign, the designer honoured his grandmother and his continuous appreciation for his "Mammaw" was seen over the weekend as the designer took his bow after the show, with Mammaw in hand. 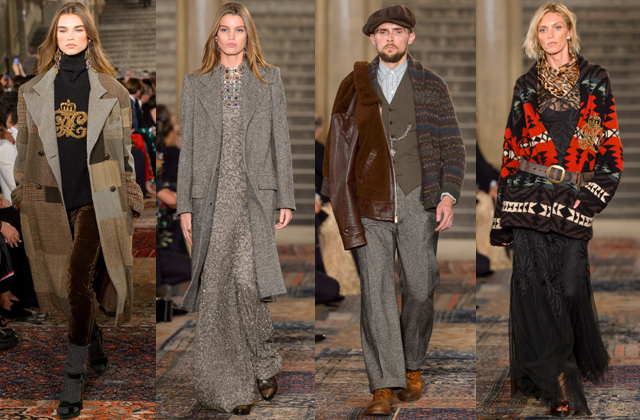 What you need to know: Perhaps one of the biggest shows on the calendar to date, Ralph Lauren celebrated his 50th year in the industry with an exceptional runway show this weekend. Taking place at the Bethesda Terrace in Central Park (it's the second time the designer has opted for this space), the show's collection consisted of a truly American aesthetic that featured models dressed in denim vests, cowboy boots, oversized knitted sweaters, tribal-printed pieces and even velvet gowns and double-breasted tuxedos. The after party: Not only did Ralph Lauren celebrate his 50th anniversary with a runway show but he also held a dinner afterwards to benefit the Central Park Conservancy. As for the guest list, literally everyone (and we mean everyone) including Oprah Winfrey, Anne Hathaway, Hillary Clinton, Kanye West, Pierce Brosnan and Ansel Elgort, were in attendance. 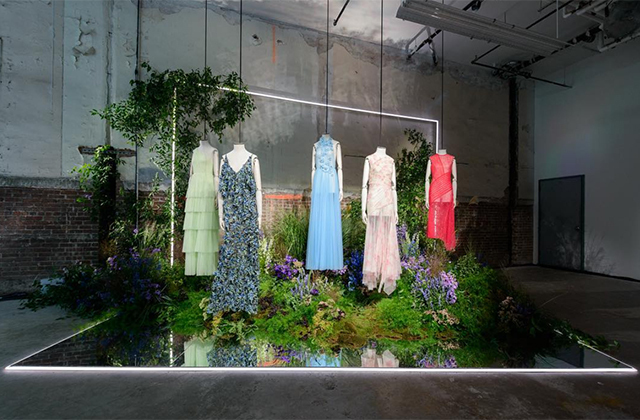 What you need to know: Although Jason Wu didn't present his latest collection in a runway format, the designer showcased his ethereal designs in a botanical setup, marking the first non-runway event he's ever staged in 11 years. The collection was beautifully crafted to empower women through its femininity and featured pieces that were as graceful as they were statement-worthy. Did you know: During the presentation, the designer revealed a new graphic logo and announced that he will be now streamlining his labels — meaning his contemporary label Grey Jason Wu, will now also be known as Jason Wu. Now, take your first look at the Kith x Versace collaboration.